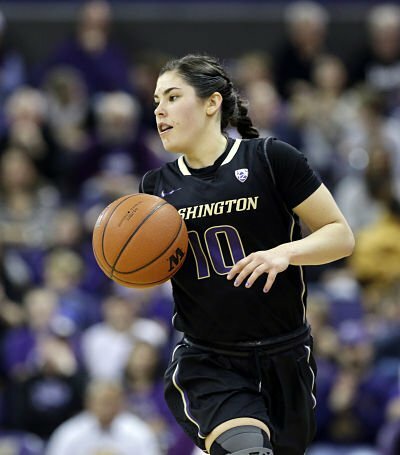 Kelsey Plum is 78 points from tying the NCAA Division I all-time scoring record after Sunday’s 35-point outing. Photo by Elaine Thompson/Associated Press. Los Angeles, Calif. – It was merely one free throw. However, it marked more than a single point in No. 9 Washington’s 87-74 victory over USC Sunday. Kelsey Plum’s shot at 2:04 left in the first quarter moved her into second place on the NCAA Division I all-time career scoring list. 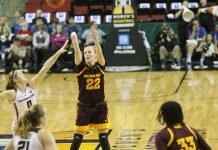 The All-American senior guard finished with 35 points to put her at 3,315 – 78 short of tying the 16-year old record of Jackie Stiles. After the game, Plum headed to the nearby studio of ESPN Los Angeles for an on-camera interview, where she talked about breaking the record. Husky center Chantel Osahor also had a big day against the Trojans, with 16 points and 12 rebounds for an NCAA-leading 24th double-double. She also became the program’s all-time rebounds leader. The game was tightly contested in the first quarter, with both teams trading baskets throughout, which resulted in four lead changes and four ties. Plum laid the ball up with a minute to go, and USC scored the next four points to take a 26-22 lead into the second period. But the visitors outscored their opponents, 32-9 in the next quarter, to take a 54-35 lead into the locker room. Courtney Jaco shoots over Hannah Johnson. Photo by Jaleesa Collins/T.G.Sportstv1. 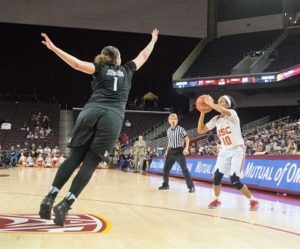 The Trojans closed the gap twice in the final two periods, but the Huskies went on a run in the fourth quarter to put themselves out of reach. Washington coach Mike Neighbors acknowledged his team’s slow start, but said they rose to the occasion at the right time. Minyon Moore led the Trojans with 20 points, Kristen Simon had 17 points and 13 rebounds, and Aliyah Mazyck had 15 points. The team is now 14-13 overall and 5-11 in conference play. USC coach Cynthia Cooper-Dyke was happy with her team’s energy, despite the loss. 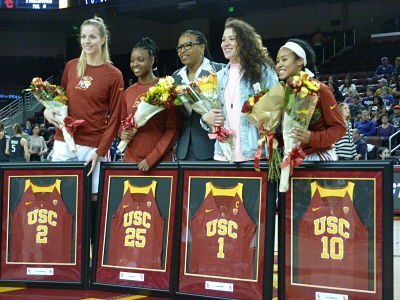 USC seniors Ivana Jakubcova, Alexis Loyd, Jordan Adams and Courtney Jaco were honored prior to tipoff Sunday. Photo by Sue Favor. Before tipoff, the Trojans honored seniors Courtney Jaco, Jordan Adams, Alexis Loyd and Ivana Jakubcova in a ceremony. Simon, a junior, was also teammates with Jaco in high school, and said she has been a role model. Simon wore jersey No. 1 – Adams’ number – to represent her on Senior Day. 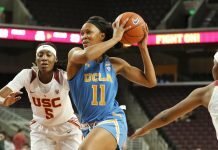 Adams, a fifth-year senior, suffered a torn ACL in November and has been unable to play. Simon said she was happy to wear her teammate’s number. Sunday’s loss now brings USC’s record to 14-13 overall and 5-11 in conference. They head to Arizona next weekend for their final two regular-season games. The Pac 12 Tournament begins March 2 in Seattle.